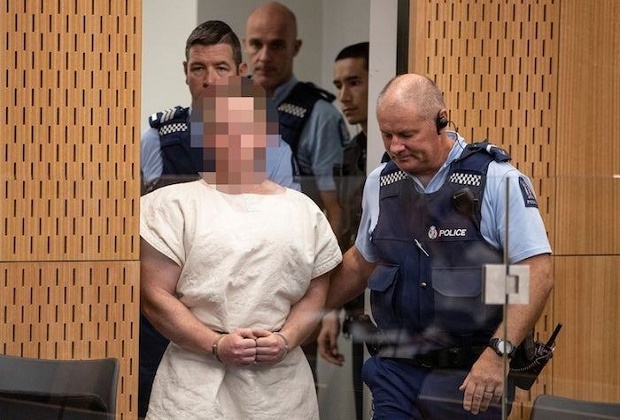 An Australian man has been charged with murder over the massacre of 49 people at two mosques in Christchurch on Friday. Brenton Harrison Tarrant, 28, appeared in the Christchurch district court on Saturday morning. He is accused of murdering a man, whose name was suppressed by Judge Paul Kellar on grounds of undue hardship to his family. No application for bail was made. Tarrant was remanded in custody without plea to the high court in Christchurch on 5 April. He appeared in court in white prison clothing, handcuffed and barefoot. He did not speak but appeared to make a white supremacist sign with his hands. After Tarrant left the court, the judge said that while “there is one charge of murder brought at the moment, it is reasonable to assume that there will be others”. Earlier, New Zealand police commissioner Mike Bush said Tarrant had been charged with one count of murder, with other charges to follow. “I want to reassure all New Zealanders that we are doing absolutely everything in our power to respond to this attack, and deploying all available resources in communities across New Zealand,” Bush said. Tarrant, who grew up in the New South Wales town of Grafton, had been living in the southern city of Dunedin, about 360km south of Christchurch. New Zealand police closed the Christchurch court to the public over security concerns, but the media was able to attend. Australian police are investigating Tarrant’s connections around Grafton. “I can advise that he was not known to authorities here in terms of extremism and those sorts of issues,” acting deputy commissioner Mick Willing said. NSW police commissioner Mick Fuller said Australian police would investigate to help New Zealand authorities and also “make sure that he hasn’t slipped through the cracks” in Australia, but said there were “no links back to New South Wales at the moment”.